A lesbian couple in Nevada is raising awareness about the inequality couples experience without marriage after Spring Valley Hospital refused to recognize their relationship. 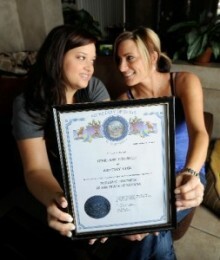 Brittney Leon and Terri-Ann Simonelli have a domestic partnership, which under Nevada state law grants couples all the same rights as married couples. When Leon checked into the hospital last month because of complications in her pregnancy, the admissions officer told Simonelli she would have to secure power of attorney to be with her partner.